Last Thursday evening as The Kindness Bus sputtered and limped its way into Oro Valley, Arizona, I had no idea what laid in store for me from two new-found friends. With a long drive in front of me to Albuquerque in a little over a week, I voiced these concerns to Ann Jansen, my contact at Harelson Elementary. She replied to me that her husband Steve is a master mechanic. The Kindness Bus was to be in their drive for a few nights. After a day of programs at Harelson and a dinner with Steve, Ann and their granddaughter, Summer, Steve said, “let’s take a look at what is wrong with your bus tomorrow.” I have to admit that it was music to my ears. 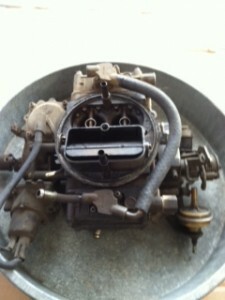 Saturday was to be the day of repairs of what turned out to be a very leaky carburetor. Steve has a tool for everything which is important when you have a bus that is very unique. I heard from Steve that when he was 15 he was hired by an auto dealer when he was told if he could rebuild and install a carburetor on one of their customer’s cars that the job was his. Hearing this, I knew I was in good hands. With a day of taking this large Holley four-barrel with every pollution control device under the sun attached to it, we cleaned each one individually and Steve started re-assembling. It was amazing to me that he knew where each part fit back together and in which order. When you get a sealed, rebuild kit from an auto part store, you expect everything to be the correct replacement and the right count. This was not the case. After getting the carburetor reassembled and installed with all the vacuum lines connected, the moment of truth arrived about a half hour after the sun set behind the mountains. I fired up The Kindness Bus and it sounded like a NASCAR lead car on the final straightaway. The engine was running full throttle on its own, a wrong length part was inadvertently part of the rebuild kit. Sunday morning was to be a quick one as all that it was going to take was to pull the carburetor and a few parts from its side and replace the wrong part. Steve did this with the precision of a pit crew mechanic. I took The Kindness Bus out for a drive and it sputtered every inch of the way. Pulling back into the driveway Steve knew that there was more wrong than just the original leaky carburetor. Steve put the engine through a series of tests and decided to replace the spark plugs after taking some temperatures of the manifold at each cylinder. Still the same result! It wasn’t until we pulled the distributor cap, which I told was not in need of replacing a month ago, did the problem get discovered. When I asked Steve if the cap and rotor were the worst he had ever seen, he in his very polite manner dismissed the question. It wasn’t until we took them to the auto part store and the salesman made a comment that “this looks like something from the Ming Dynasty” that my suspicions were realized. A distributor cap and rotor are parts that are easily replaced and when I started the engine and heard the sound, I knew that these much needed repairs will give The Kindness Bus another couple of years of trouble-free performance. One more thing needs to be said, Steve gave up an afternoon of time with his grown son to make sure my travels would be without concerns of breaking down on the side of the road. With all of this said, and knowing the level of kindness that Steve and Ann showed and that this is how they are to everyone, I think I had better rename this blog, A Lifetime of Continual Kindness. I told Steve at the end of these two very long days that, he saved me. Nothing could be more true. This entry was posted on Tuesday, April 10th, 2012 at 8:52 pm	and is filed under Kindness. You can follow any responses to this entry through the RSS 2.0 feed. You can leave a response, or trackback from your own site.